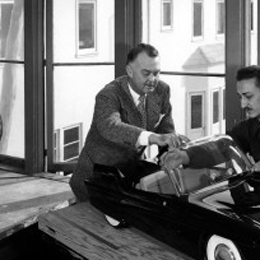 US automotive designer who began working with General Motors in the late 1930s. In 1937 he was on a GM team that, in liaison with Opel, designed the Opel Kapitan. The Kapitan featured innovative styling features including built-in headlights, stretch fenders and a clean body style. It remained in production until the early 1950s. After WWII, he became transportation department head at the Art Center College of Design, and with other Art Center faculty was invited to Japan for six weeks in 1956, giving lectures and demonstrations about modern techniques in industrial design. In his honor, the George Jergenson Design Achievement Award was established at Art Center, for outstanding alumni. Jergenson was a member of the Industrial Designers Institute (IDI), and was awarded IDI Fellowship that was honored by IDSA when it was formed in 1965.